“Forest Story” Graphic Set consists of 36 minimalistic forest motive illustrations, 1 poster and 4 seamless patterns. This graphic collection will be great as a prints, posters, cards, wrapping paper and packaging design, fabric design, home textile and interior decoration, bed linen, clothes print. Free for download. File format: .ai, .eps Photoshop or other software. 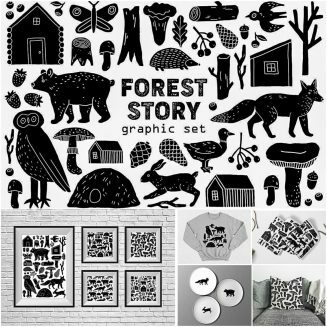 Tags: animal, bear, folklore, forest, fox, linotype, owl, scandinavian, stamp, tree, wood.